On Mother's Day, at a table in the live performance area of South Restaurant, I admitted to the woman that has raised me as her own since 16 and her daughter, who'd become my sister, that I hated my mother. Not long after, the tears began to fall as I fought to hold down the wail pushing up from the depths of my soul. I know my revelation stunned them, but for me, it was a relief to say it out loud finally. I truly hated my mother. It went against the very core of who I am as a person to say this. It also felt like I was betraying one of the sacred foundations of my religion which has such a high honor for the mother as well. Yet, in that moment, I felt like an anvil had been lifted off my shoulders. Hate was a strong word but it was the only word that could describe how I felt. I hated my mother because of the way her illness, Depression, negatively impacted myself and our family. An illness that she had been battling since her eldest son was born. I've never known what a normal life was as a result of her diagnosis. So, despite living with my mother, despite her being physically present, she was absolutely unreachable and absent for large sections of my life due to her battle with it. When she was present, she was an amazing woman with a beautiful smile, cooking skills to rival the hood's best chef, and a great mother. However, far too often, especially as I grew older, my mother spent her time in the darkness and haze of broad systemic depression and psychosis. In fact, many times, she pratically lived inside of hospitals for mental illness, with each reason for the hospitalization growing more severe the older I got. I also became increasingly hopeless of a resolution because there seemed to be no relief or resources that could fix the problem. Making matters worst, she would often cling to her faith and utilize that as her only option in some cases to treat herself. So, it wasn't uncommon for me to wake up with olive oil crosses drawn on my door, loud gospel music playing and my mother "speaking in tongues and crying" which then turned into an expletive filled rant against the people who were trying to kill her and destroy her family. I always felt as if I was walking on egg shells in these moments because nobody was off limits in her quest to prove that she was being unfairly targeted. Often times our personal belongings would disappear, the culprit, my mother who decided we'd tried to kill her or had "fucked" with her stuff so she meted out retribution. Sometimes her mental illness would present itself as wanting to fight and attack us viciously while in one of her psychotic breaks. Other times it appeared as a silent darkness that surrounded her, held held her a prisoner within her own mind and caused her to lay in bed crying all day long. As I grew older, my resentment of my mother grew. Each day I walked home from school, I would be overwhelmingly crushed with anxiety, afraid that when I turned the door knob, one of my parents would be dead, physically, and the other mentally from the deed they'd done. One day those fears almost materialized when I'd come home and found my father bleeding up his arm and cracked glass on the floor from a window that held trinkets in our dining room. Both of my parents were listlessly sitting in various areas of the home as if in shock. Like an adult, I walked in assessed the situation and immediately took charge. I told my mother she had to leave right now or either go to the hospital again. Of course she refused and we engaged in a verbal argument that resulted in her attacking me, the police being called, and her having to be 302'd. At 15. Fif-freaking-teen. It was the first of many physical altercations in my teen/young adult years. Finally at 16, having just become a convert and moving in with Momma Sue and Imam Saulih, I decided it was time to get away from the chaos. They opened their home to me at a time when my parents separated for good and my dad was forced into foreclosure on the home I'd lived in since I was 12 years old. After moving constantly, switching back and forth between parents when they would briefly separate, I now had a stable home where I never had to worry if the lights would be turned off or if someone was dead. Throughout college, I would send my parents, mostly my mother, money if she needed it at a time when I should have relied on them for at least moral support. Here I was, the first of my siblings to enter and complete a four year college program and I had to pretty much navigate that process alone, while working, and using money for books to send my parents what they needed. This later became more manageable once I could simply charge the things that I needed on a credit card...this is one of the reasons I amassed large debt in my early years. When I started my own family, I wanted to have a fresh start with my mother. So Matt and I moved into a two bedroom apartment with her while I was pregnant with my oldest Salah and up to my pregnancy with Sahar. At first it worked well, but the mental illness of my childhood that laid siege to my mother returned with a vengeance. She'd clearly stopped taking her medicine. The results of our ordeal left my wedding ring stolen (presumably taken by her), my high school ring stolen (presumably taken by her), and my computer I was using for college broken after she poured a cigarette filled cup of water onto it in a fit of spite and anger. I can't remember if that was before or after she broke the no pork in the house rule and cooked up two pots of chitterlings while Matt watched Salah during my day class at Temple. It was during this incident that she physically attacked me while I was pregnant with Sahar. The kicker? Us calling the police and me being threatened with prison by a female cop and having my children taken away because I was the problem and didn't respect my mother. The other police officers gave us options to have her 302'd so we took a trek to Belmont Mental Health hospital in Germantown only to be told there was not much we could do unless she voluntarily checked herself in to the hospital. This pattern would continue to repeat itself over the next 10 years as we allowed my mother to come back and live with us in every single home we had only to have it be the worst decision we could have possibly made. This cycle only stopping recently when I hit a wall psychologically myself and put my foot down to being used by her or anyone else in my family at 31 years old. The truth was, I could not save her and I needed to refocus my energy to my family and my own mental stability. After this realization, it occurred to me that I'd never processed my childhood. I'd never processed the trauma caused by my mother and the trauma she didn't protect me from. I looked into the mirror on Mother's Day 2017 and I wanted to cry because the truth hit me. I hated my mother. There I was getting ready to meet Momma Sue and Faaizah, to enjoy being mothers. A reservation that I'd also very briefly thought of adding my mother to like I'd done a few years ago at the Moshulu. Yet, that idea had been quickly cancelled when two days before, she'd demanded my husband and I give her money because apparently, our money was also her money. By the time Mother's Day arrived, she'd essentially stalked me for two days about money and while at the restaurant, my husband sent multiple texts chronicling her unexpected visit. She'd gotten on the bus and was posted up outside the house. Of course she had her trusty shopping cart with her that goes everywhere she does and includes a suitcase full of clothes, cleaning supplies, papers, and whatever else she deems valuable. Outside, she yelled, screamed, and spoke in gibberish until Matthew opened the door, gave her a present my sister had given me a week before to give her on Mother's Day and told her to go. 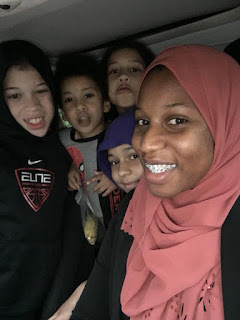 As I set there and read his texts as the ordeal unfolded, I looked up from my phone and into Momma Sue and Faaizah's eyes and said, "I realize that I hate my mother, and I don't feel bad about it anymore." The tears fell, and with it went my fake brovado. I actually did feel bad about feeling this way and if I wanted to fix that, I needed help. Without it, my hurt and anger would eat at me and possibly lead me to the same destructive path. So, I got a referral and after staring at the number for a few more weeks I made my first appointment. Therapy was a necessity to healing. After going for the past couple of months, I can now talk to my mother without having to hold down a dragon full of rage and anger within my chest. I do screen our calls and put a limit to our interactions. This I must do for my sanity. What therapy has taught me is not to feel bad about removing toxicity from my life. I don't have to save everybody and actually trying to do so is a character flaw within myself that needs to be corrected. So while I'm unsure if I'll ever forgive my mother for the hurt that I experienced, therapy helps me to understand that she herself is a victim to her illness. An illness in which so many in America suffer, but where there's so few resources and treatments offered to fix the problem. Most importantly though, therapy helped me realize that I really don't hate my mother. I hate what the illness had done to her and the people she loves. But, I don't hate her.